The joint venture teams after celebrating the official formation of SaBuCo. The three SaBuCo partners after signing the agreement. The Saudi Butanol Company (SaBuCo), which will be building the world's largest butanol plant in Jubail, Saudi Arabia, was recently registered by the Saudi Ministry of Commerce and Industry. 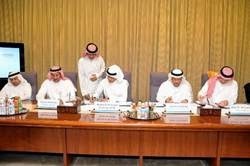 At its first meeting in Jubail recently, the SaBuCo board observed that the new joint venture was a reflection of the strong cooperation between three leading Saudi petrochemical companies and their commitment to create economic value through efficient and effective utilization of the Kingdom's natural resources. The three project partners are Saudi Kayan Petrochemical Company (SAUDI KAYAN), a manufacturing affiliate of the Saudi Basic Industries Corporation (SABIC); Sadara Chemical Company (Sadara), a joint venture developed by Saudi Arabian Oil Company (Saudi Aramco) and The Dow Chemical Company (Dow); and Saudi Acrylic Acid Company (SAAC), owned by TSOC, an affiliate of Tasnee Company and Sahara Petrochemicals Company. 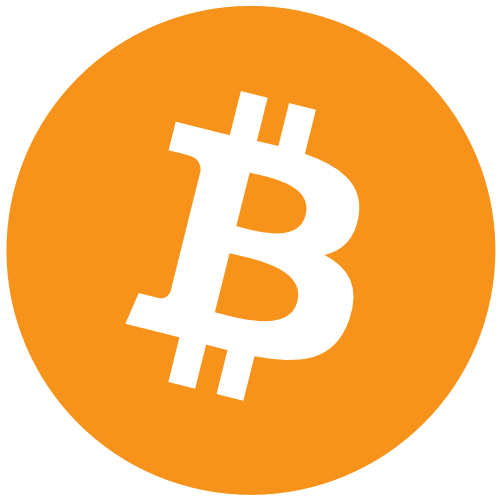 The partners are now in the process of executing agreements to further consolidate the partnership and business collaboration. The agreements cover several key elements, including financing, tolling, operations & maintenance, engineering & procurement, construction, project management consulting, and technology licensing. A celebration to mark the official formation of the company was held in Riyadh recently by the three project partners. While thanking the Ministry of Petroleum and Mineral Resources and the Ministry of Commerce and Industry for its continuing support, they pledged to further expand and deepen their cooperation to promote development and diversification of the Kingdom's economy. With an estimated investment of $517 million, SaBuCo will build the first ever butanol plant in the Middle East and its products will support the continued growth of the paints and coatings industry in Saudi Arabia. The design capacity of the plant, which is scheduled to go on-stream in 2015, is 330,000 metric tons per annum of n-butanol and 11,000 metric tons per annum of iso-butanol. 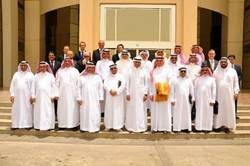 Mazyad Al-Khaldi, SAUDI KAYAN President, said that the project will add a new product to the SAUDI KAYAN portfolio, which will contribute to the development of the local downstream industry. 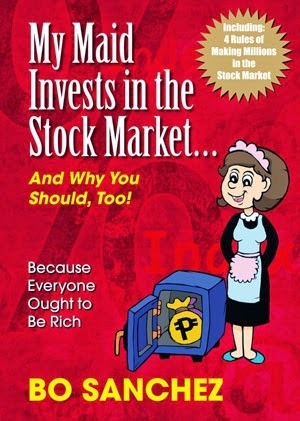 "We are happy at the success all of us have achieved in arriving at a workable business arrangement. It was only due to the dedicated efforts and teamwork on the part of all the partners in all areas that we have been able to make the project a reality," he said. Ziad Al-Labban, Sadara CEO, said, "This is another example of success through teamwork and collaboration. We are pleased to team up with SAUDI KAYAN and SAAC in this joint venture to create further downstream economic value in Saudi Arabia from butanol-based products." Saleh Al-Nazha, TASNEE CEO and SAAC Chairman, who has been named the General Manager of the new company, said that the Butanol plant will provide additional integration to SAAC's Acrylates Complex, which is the first complex of its kind in the region. "We greatly appreciate the opportunity to collaborate with SABIC/SAUDI KAYAN and Sadara and their trust in TASNEE to build and operate the joint butanol plant on behalf of the partners. We can jointly benefit from the economies of scales which will enhance our national petrochemical industries' competitiveness in the world." As per an earlier agreement signed in December, 2012, the new butanol plant will be located at Tasnee's Petrochemical Complex in Jubail Industrial City and will also be operated by Tasnee. It will open new job opportunities of around 200 direct and indirect positions for Saudi citizens in strong support of the Kingdom's efforts to create long-term, value adding jobs for nationals. أعلنت الاتصالات السعودية عن تخفيض بنسبة 50% من قيمة المكالمات الصادرة إلى الفلبين في يومها الوطني، والذي يصادف يوم الأربعاء الموافق 12 يونيو 2013م، والتخفيض يشمل أجور المكالمات الصوتية والمرئية والرسائل النصية SMS ورسائل الوسائط المتعددة MMS الصادرة من الجوال وسوا، ونوهت الشركة إلى أن التخفيض يستمر لمدة 24 ساعة في نفس اليوم. 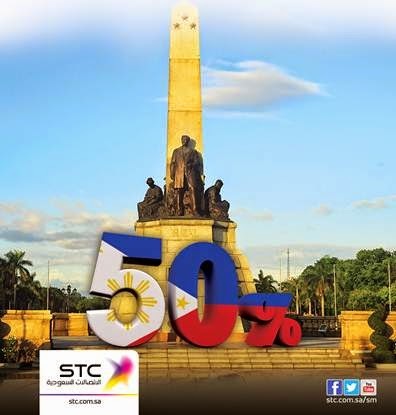 STC announced a 50% discount on the price of calls to Philippines on the occasion of its national day on Wednesday June 12, 2013. The discount covers the prices of voice and video calls, SMS messages MMS messages made from AL Jawal and SAWA. This discount is good for 24 hours on the same day. CAM02225, originally uploaded by arleighmac.